As a teacher, Marcia Chatelain—a Georgetown University professor—knew talking about Ferguson in the classroom last August might be challenging for many educators. As Chatelain explained in The Atlantic, she tweeted teachers—asking them to devote one day to talking about Ferguson in their classrooms. And she prompted them to use the hashtag #FergusonSyllabus to suggest a book, song, poem, article, assignment, or work of art to use in lesson material. Thousands of tweets poured in. And not only from teachers whose subjects typically lend themselves to current events. For example, a science teacher planned to talk about the chemical makeup of tear gas and its harmful effects. A fashion professor was going to discuss the history and effect of protest clothing on American fashion. Recently, after the officer who shot Michael Brown and the officer who killed Eric Garner were not indicted, the hashtag was again inundated with different conversation points, pictures, and history texts. “What #FergusonSyllabus has provided teachers is a way to not feel alone or isolated in this process,” said Chatelain in an interview with PBS NewsHour. Of course, as the hashtag activity ebbs and flows with media coverage, students need support dealing with issues of racial inequality and social justice year round. And although an uptick of pooling resources occurred in recent months, many organizations and educators offer helpful online materials for teaching social justice and supporting youth in understanding and resisting racial discrimination and oppression. 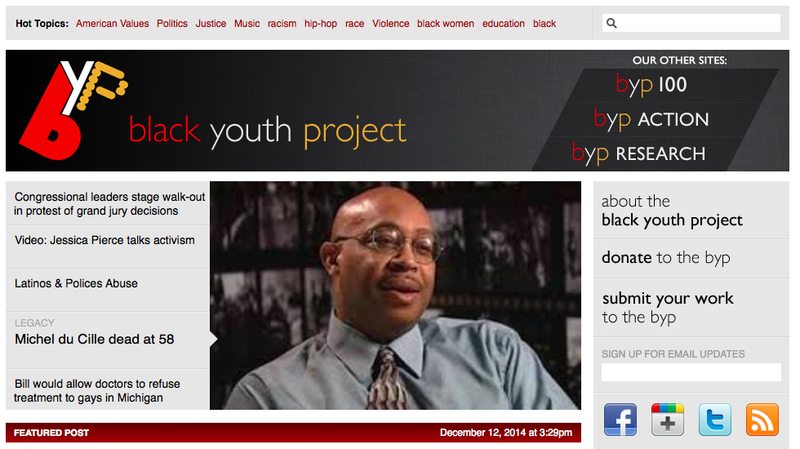 One spot that’s been a resource for teachers and young people alike is the Black Youth Project’s blog, which is updated several times a day with news flashes, featured stories from around the web, and original blog posts. The blog works to amplify the voices of young black writers and provide an uncensored platform for their perspectives. For example, Jenn Jackson recently explained her take on the hashtag #CrimingWhileWhite. Cohen said there’s all kinds of potential when teachers guide their students to the site and that some teachers have used the blog as a place to prompt a daily writing exercise. They can also learn about the activism of the Black Youth Project 100 (BYP100) or access further teacher resources and curriculum materials. Nonprofit organization Facing History & Ourselves, another Educator Innovator partner, also has an expansive resource section that includes lessons and unit plans with videos, interviews, photos, articles, and other sources on topics ranging from the civil rights movement to studies of the Holocaust. In August, Mary Hendra—an associate program director at the organization—discussed how history, particularly the history of the 1992 riots in Los Angeles where she’s based, is being taught to deepen the understanding of events in Ferguson. Documentary site and PBS partner POV contributed to #FergusonSyllabus by collating documentaries and discussion guides on topics like police brutality or the 1967 protests in Newark, New Jersey. The site also has discussion guides and instructions on how to access the films for free. Of course, although teachers might address social justice issues in the classroom, young people are talking about these issues on their own time, too—both in person and online. In fact, it’s young people who have been leading and organizing much of the #BlackLivesMatter movement on Twitter, on other social media, and in the streets in cities throughout the nation. Most of what we know about the protests in Ferguson or the footage of Eric Garner’s death has come from young people tweeting, recording, and documenting these events on their phones. The hashtags young black people have developed, like #BlackLivesMatter or #IfTheyGunnedMeDown, have played a crucial part in framing the current public dialogue on race and criminal justice. The network defines participatory politics as “interactive, peer-based acts” in which people exert voice or influence on issues of public concern. For many young people, engaging in participatory politics by sharing, tweeting, or commenting on social issues online is part of their normal daily routines. So if many young people are already contributing to conversations on social justice in their own lives, what’s the role of the classroom teacher? Cohen said educators can help support students as they express themselves online. A whopping 84 percent of youth surveyed by the YPP Research Network said they think they and their friends would benefit from learning more about how to tell whether information they find online is trustworthy. “They’re still looking for insight [into] helping them evaluate,” Cohen said. “So while we want to respect their expertise, we also can provide support and guidance.” Educators can also help students place this movement into a broader historical context and can help make sure students are thinking critically about this movement and their participation in it. Even before digital tools existed, educators have always helped young people understand and make meaning of current events. In some ways, using different resources to teach and talk about Ferguson and the following demonstrations is no different. What is different today, though, are the opportunities digital tools provide for youth to amplify their voices and experiences. Digital tools give today’s youth the chance to talk back in a new way—at a new volume and magnitude that’s already making history.